Should you want to experiment with cellaring and maturing wine at home here are some recommended wine coolers for aging. 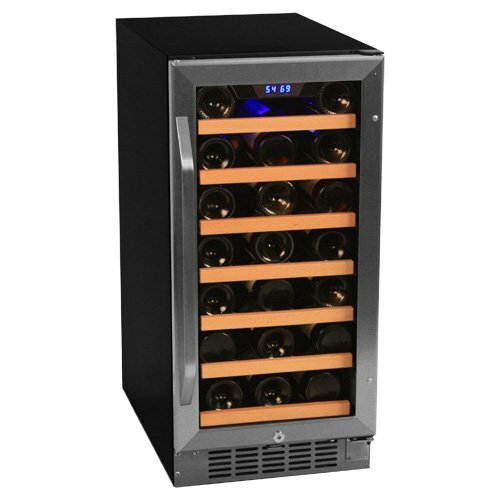 Most wine refrigerators are designed for short term storage of wine (max. 1 year) and thus they don’t have the technical features such as humidity control, to provide proper conditions for maturing wine. It is also true that not all wines are good for aging, in fact the majority of them is best consumed young within one or two years of bottling. The aging of wine is a chemical process meant to develop the wine’s complexity over time and produce wine that has a more balanced taste than it would have if drunk young. Most people think that wine in general is better if it’s kept longer in the bottle or in a barrel to let it mature. This isn’t true, in fact as I already mentioned most wines are consumed rather young, after 12-18 months after they’re made. Not all types of wine are meant for aging and even those that are can go spoilt and become undrinkable, especially if the storage conditions aren’t adequate. This especially applies to inexpensive wines (cc. under $20) that lack the structure for required for successful aging. If you keep a wine that isn’t good for maturing for too long it will lose its initial vivacity and becomes dull. Which Wines are Recommended for Aging? If a wine is not good when it’s been made, aging won’t improve it and turn it into a good wine. Wines that are worth aging contain a fine balance of acidity, tannins and fruity tastes. The aging of wine is however a fairly unpredictable process and one cannot tell for sure whether the maturation will be successful; resulting in a well-balanced wine that is much finer than it would have been without aging. Some wines won’t improve at all and if one isn’t careful enough it can go off, losing all its original characteristics. TIP: It is better to open a wine too early and drink it while it’s still enjoyable then wait too long, when it is past its peak and becomes flat. So which wines have the potential for aging? A balanced content of three components (tannins, acids and sulphites) makes a wine potential for aging. If you picked wines that are worth aging the next requirement for success is proper storage conditions. The ideal storage place would be a cool, dark cellar with relative humidity of 65-75% to prevent corks from drying out and letting in oxygen. The ideal temperature for proper aging of wine has to be around 55ºF – 57ºF (cc. 12ºC – 14ºC) with minimal fluctuation. Not many of us have a real cellar underneath the house, so let’s look at other options for storing wine for maturation purpose. Many people rent cellar space nearby their home. In a professional wine warehouse ideal conditions are guaranteed. The rental fee in offsite wine storage facilities is around $2/case/month. Some facilities offer annual rates. The drawback of storing your wine offsite is that you won’t be able to enjoy wine as frequently as you would if you stored it at home where you have easy access to it. On the other hand, you will be also less tempted to open a bottle too early, before it reached its peak. If you have enough space and money you can build a custom wine cellar which is a good investment because it not only preserves your wines and enables you to experiment with aging, but it increases the value of your home. For those who are limited on space in their homes and want to be able to access their wines all the time, a climatized wine cabinet or wine refrigerator is the way to go. The following recommendation includes wine bottle storage units that are equipped with proper temperature and humidity control to provide ideal conditions for long term storage and aging of wines. EuroCave is a French company reputed for its high-quality European-style wine cabinets. Eurocave was the first that made climatized wine cabinets (in 1976) that imitate the condition existing in natural cellars. Today they offer a wide range of wine cabinets, storage equipment, presentation and serving accessories. They’ve recently added a new range of wine cellars (92 range) to their product line, made specifically for maturing wines. These wine cabinets are equipped with state-of the-art, patented Néofresh technology ensuring precise temperature and humidity control. effective anti-vibration system that ensures quiet, undisturbed storage environment for the wines inside the cabinet. Read more about the features and benefits of EuroCave Wine Cellars. The EuroCave V292 wine cellar is a single temperature zone cabinet that accommodates 174-210 bottles of wine depending on shelving configuration. If you need a smaller cabinet then take a look at the EuroCave Compact Series Wine Cabinets offering small (V059), medium (V159) and large (V259) models. The next best choice for a self-contained, climatized storage cabinet for aging wine after EuroCave is Le Cache wine cellars. They have a wide range of cabinets in various sizes and decor. The cabinets are equipped with CellarPro cooling system with adjustable humidity. You can set the desired cabinet air humidity on the control panel of the cooling unit. The CellarPro cooler balances the compressor and fan cycles to adjust the amount of air moisture circulated within the cabinet. The Australian based Transtherm/Vintec offers wine cabinets that are made by EuroCave but are slightly cheaper than the ones made in France. The smallest model is the single zone Transtherm Studio that holds 36-42 bottles of wine. The size of the cabinet is very compact (H: 640mm/25.2″, W: 540mm/21.26″, D: 557mm/22″), the unit fits neatly under a kitchen worktop. The temperature can be set to 32ºF – 57ºF (10ºC -14ºC). 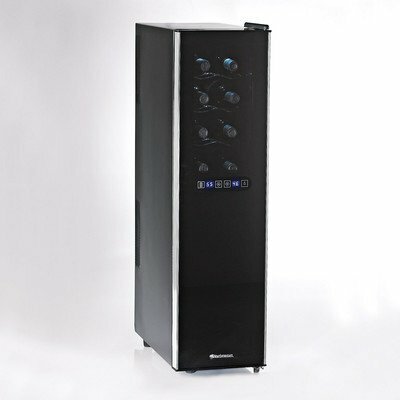 Price of Transtherm Studio wine cooler cabinet: cc. US$ 1800 (GBP 1100). Sub-zero is an USA-based manufacturer of high-end refrigerators and freezers and they also have top-quality wine cooler refrigerators. 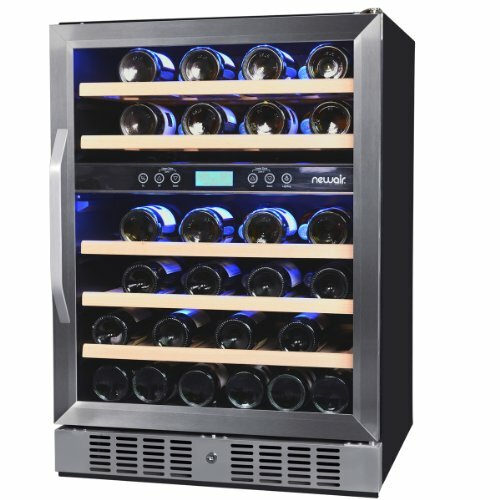 Sub-Zero wine coolers contain dual evaporators in each zone for maintaining moderate (around 50%) relative humidity. The temperature can be set from 38 to 65 deg. Fahrenheit which is a fairly wide range. The dual pane door glass contains a protective film layer that filters out UV rays protecting wine from possible damage caused by too much sunlight exposure. 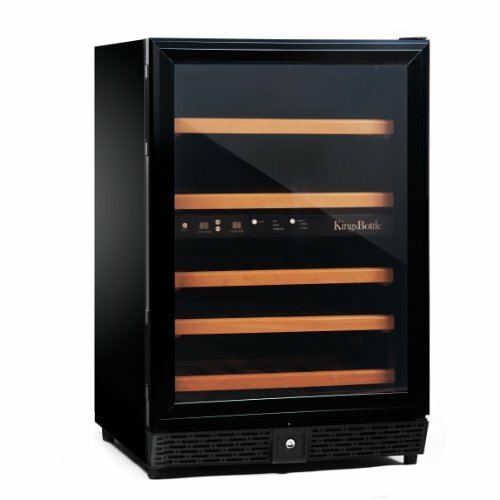 The Sub-Zero WS-30 is a 147-bottle, full-size wine cabinet, but if it’s too large for you then take a look at the Sub-Zero 315W, a single zone, under counter model with 26 bottles capacity. Vinotheque Wine Cabinets are elegant wood wine cellars that contain powerful and reliable cooling system. Large Wine Refrigerators – recommendations for capacious wine coolers with 100+ bottles capacity. Refrigerated wine cabinets – elegant wood wine cellars mainly for freestanding placement. 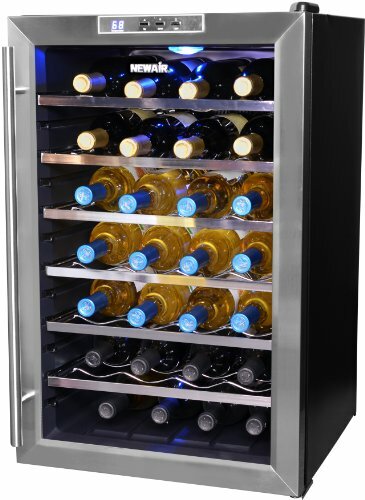 40-50 Bottle Wine Cellars – Top picks of mid-sized wine coolers. Wine Credenzas – attractive wood wine storage units for freestanding placement. Includes brands such as Le Cache, Vinotheque, AmeriCave and Vinotemp. Walk-in Wine Cellars – if you have enough space in your home then a walk-in wine room with wine management software might be a good investment.